At such an affordable price it’s hard not to like the LT-Echo 10. While Blackstar continues to dominate live stages with its beefy Artist stacks and combos, it’s also managed to corner the market in small practice amps - combining digital effects and solid-state with a warmth that often sounds more like valves. The latest addition to Blackstar’s catalogue is called the LT-Echo series, which includes this incredibly cute little combo, the LT-Echo 10, firing 10 watts into a 3" custom-design loudspeaker. The LT-Echo 10’s controls are simple and straightforward: a trio of knobs covering volume, tone and delay time, with a pair of button switches to swap between clean and overdrive sounds and toggle the LT-Echo’s built-in tape delay effect. There’s an MP3/line in and a speaker-emulated headphones output that can be plugged into a PC or mixing desk. In use, the little LT-Echo 10 sounds like Wembley Stadium with the delay engaged, rocking an excellent 80s distortion that’s great with humbuckers or single coils, alongside sweet Fender-inspired clean sounds. The overdrive gain, delay feedback and mix level are pre-set. However, Blackstar has chosen sensible delay settings with plenty of drive to suit most tastes. Blackstar’s patented ISF control sweeps the EQ response from British to classic USA, accenting midrange at one end of the sweep and treble and bass at the other. 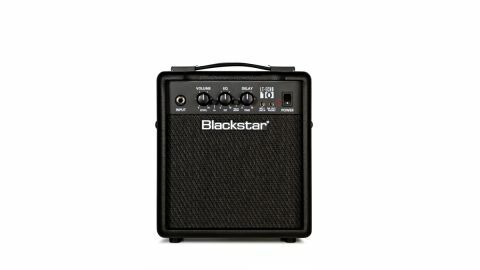 It may look like a toy, but this is a real Blackstar that’s perfect for beginners and home practice, with great plug ‘n’ play potential for desktop recording studios.